WITH ALL CIRCUITRY BUILT INTO THE MICROPHONE! Upgrades Existing HF-SSB Radios to provide High Reliability Digital Selcall and Telcall capability. Interoperable with Australian Standard Formats (based on CCIR 493-4) as is used by Barrett, Codan, Icom, Q-Mac, and SGC (Note: WA2 format is no longer supported). The SC1001 HF Selective Calling Module successfully pioneered the market for a field retrofitable module to upgrade existing HF radios to provide advanced selective calling capabilities. Jenal Communications is pleased to offer the latest developments in the HF Selective Calling microphone family the SC2. Now upgrading and field retrofitting HF radios is easier than ever! The SC2 Selcall/Telcall Microphone is a convenient handheld unit with all HF encoding and decoding circuitry built in! It can be easily attached to the microphone connector of virtually any brand of HF-SSB radio. When plugged into the radio, the SC2 adds a full range of high reliability selective calling capabilities. The SC2 utilizes the popular Australian Selcall/Telcall signalling formats. These field proven digital formats, based on CCIR recommendation 493-4, provide economical and reliable selective calling, optimized to the vagaries of HF-SSB communications. The SC2 is fully compatible with existing radios and networks utilizing our earlier SC1001 modules as well as those with Codan and Barrett selective calling and telephone dialing systems. Convenient control and programming is provided by the keypad on both the SC2. 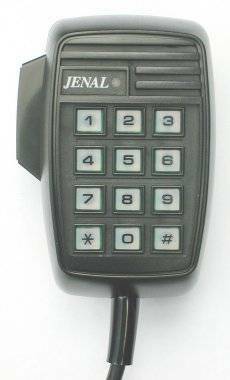 The keypad enables a wide variety of functions such as Selcalls, Telcalls, Beacon Calls, Repeat last Selcall/Telcall, Recall last Caller, Mute/UnMute, Hang-up, and Alarm Reset. A series of audible tones and alarms through the radio's loudspeaker, or through the microphone's internal Piezo alarm, provides positive operational feedback. Tones are provided to confirm key entry, Selcall Mute/UnMute, and entry error. Distinctive alarms are provided for receipt of Selcalls or Telcalls, including a red LED on the front of the microphone. In the event that a call is not promptly answered, distinctive background alarms beep every five seconds to alert a returning operator that a call (and which type) was received. The SC2 is simple to connect to a radio. There are a maximum of nine, and a minimum of five possible connections. The minimum connections are: Power, Ground, PTT out, Transmit Audio and Receive Audio. Additional connections are available for: Mute, Scan Control, Audio Alarm and an Alarm Relay Driver. Optimum audio levels can be precisely adjusted by the the internal ten turn potentiometer controls. All programming of the Selcall Self-ID and operational modes is via the microphone keypad. The SC2 options include programming of format (Codan, Barrett), scan control format, scanning reset timer, beacon mode selection, and transmit or receive disable. The SC2 is normally supplied with a "pig tailed" cord. On special order it can be supplied prefitted with various standard microphone connectors. Auto-Scan Reset Timer (SC2 only). Transmit Audio and Alarm Audio. A Relay Driver is available for Latched Alarm or Horn Alarm Output (30V 250 mA max relay coil, active low).